With the 19th Annual RiverRun International Film Festival officially in the books, here are the titles (reviewed in alphabetical order) that I caught during the esteemed Winston-Salem event. BRAVE NEW JERSEY — Nearly 80 years later, it remains one of the greatest hoaxes in American pop-culture history. On the evening of October 30, 1938, Orson Welles and his Mercury Theatre presented a radio broadcast of H.G. Wells’ The War of the Worlds, modernized to make it more immediate to American listeners. The program, complete with news bulletins and off-the-air music breaks, resulted in scores of listeners believing an alien invasion was really occurring — this led to general panic, newspapers covering the fake-out for days on end, and one more step in Welles’ ascension as a boy genius. 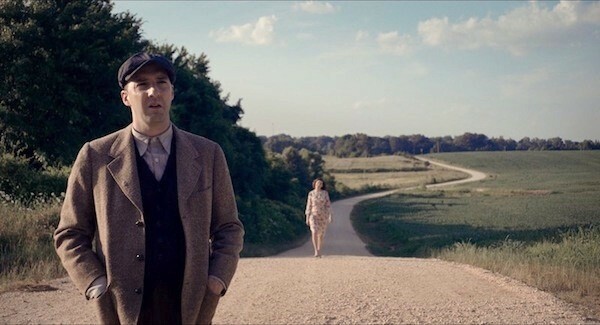 Brave New Jersey offers a fictionalized take on the ensuing hysteria, focusing on the members of a small town located not far from where the invasion is supposedly taking place. Writer-director Jody Lambert (co-scripting with Michael Dowling) does a nice job of delineating how stressful circumstances bring out the best in some and the worst in others, and many familiar faces dominate the cast — among them Emmy Award winner Tony Hale (TV’s Veep) as the burg’s meek mayor, Anna Camp (Pitch Perfect) as a deceptively docile schoolteacher, Heather Burns (TV’s Bored to Death) as the long-suffering wife of the local bigwig (Sam Jaeger), and veteran character actor Raymond J. Barry (Born on the Fourth of July, TV’s Justified) as a former army officer who organizes the stand against the malevolent extraterrestrial visitors. THE COUNTRY DOCTOR – The French release Médecin de Campagne is making the English-language rounds under two different titles, although, truth be told, either works equally well. The Country Doctor (its moniker on the festival circuit, or at least at RiverRun) and Irreplaceable (its name on IMDb and Rotten Tomatoes) both fit this low-key effort about Jean-Pierre Werner (François Cluzet), a provincial doctor who provides that personal touch when treating all of his patients. But after Jean-Pierre learns he has cancer, he’s forced to groom a potential replacement in Nathalie Delezia (Marianne Denicourt), a less seasoned doctor who hails from the city. Jean-Pierre imparts his wisdom on Nathalie, who, of course, has a lot to learn but who also proves to be a quick study and in some instances even improves upon her mentor’s bedside manner. Cluzet, star of the international art-house hits The Intouchables and Tell No One, and Denicourt find the proper measure of gentle tension in their characters’ relationship, and if there’s absolutely nothing in the film that can be described as surprising, it’s still an engaging watch that goes down easily. PRISON DOGS – Of all the films I caught at this year’s RiverRun, this was my favorite. Admittedly, this exceptional documentary already has a leg up on the competition because, well, puppies! Seriously, though, the film is a rarity in that it pays more than the usual lip service to the notion of second chances – instead, it explores the themes of redemption and rehabilitation in a manner that’s both immediate and inspirational. Its focus is on Puppies Behind Bars, one of several programs across the U.S. (this one founded by Gloria Gilbert Stoga) which pairs carefully selected inmates — ones serving hard time for murder, robbery and assault — with cuddly canines. The prisoners have two years to teach the puppies over 100 commands — at that point, the animals will be paired with veterans who are suffering from PTSD. There’s plenty of heartbreak to go around. If Stoga – who’s amusingly feared by everyone, felons and filmmakers alike — decides that an inmate isn’t devoting enough attention to his assigned puppy, then back he goes into the general prison population, with the dog assigned to another handler. If a dog is determined even after two years not to be sufficiently capable of functioning as a service animal, he or she is instead given away as a pet (a situation doubtless more disappointing for the inmate who provided the training than for the dog itself). And then there are the teary farewells between the inmates and the dogs they’ve raised as their own for two years, now being handed over to other people. Yet through it all, what shines brightest is Stoga’s belief that everyone deserves a second chance, and it’s beautiful to watch these men who have committed bad deeds against society now learning not only skills but also empathy on their road back to civilization. As Geeta Gandbhir, who co-directed with Perri Peltz, and Tracy Pennycuick, one of the PTSD survivors featured in the film, revealed at the excellent post-screening Q&A, Prison Dogs is available to view on both Amazon Prime and iTunes. 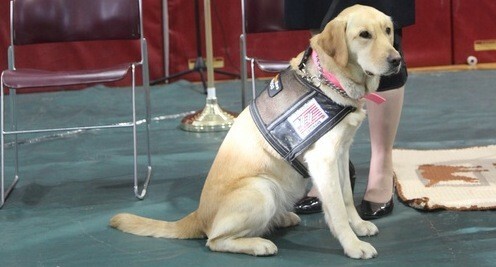 Incidentally, Pennycuick was accompanied by her “prison dog” Murphy, one of the canines seen throughout the movie. At the Q&A, Murphy received lots of hearty pets from her fans (yours truly included). QUEST – The two best films I saw at RiverRun this year were both works of nonfiction. One was Prison Dogs (above), while the other was Quest, which ended up winning the festival prize for Best Documentary Feature. In the manner of the classic Hoop Dreams, this richly realized effort from director Jonathan Olshefski looks at the triumphs and travails of a lower-class black family over the course of several years. And like many documentaries (The Queen of Versailles springs to mind), it’s one that began as one sort of project before the real world shaped it into something different. It was initially conceived as a look at the neighborhood music studio created by Christopher “Quest” Rainey, who lives in North Philly with his wife Christine’a “Ma Quest” Rainey and their bright daughter Patricia “PJ” Rainey. Filmed over the course of approximately a decade, this powerful and poignant picture moves well beyond its original niche to examine a family that eventually has to contend with the tragic specter of violence as it directly impacts them and ensures that nothing will ever quite be the same again. Other characters – family members, neighbors, supportive cops – float in and out of the narrative, but the focus is never far removed from the formidable trio at its center. Quest primarily unfolds throughout the Obama years – indeed, the elections occasionally pop up in the story – but with the dawning of Trump’s AmeriKKKa (the tyrant even pops up briefly, imploring African-Americans to vote for him), its import as a document of the marginalized and the victimized looms larger than ever before. 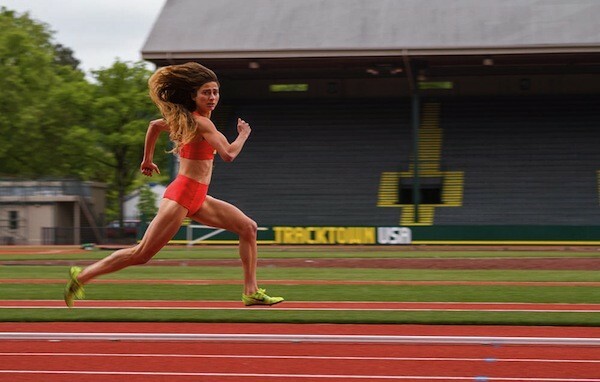 TRACKTOWN – Alexi Pappas is a Greek-American long-distance runner who competed in the 2016 Olympics, where she finished 17th in the women’s 10,000 meter competition. Nothing if not ambitious, Pappas also co-wrote (with Jeremy Teicher), co-directed (ditto) and starred in Tracktown, a seriocomedy about a long-distance runner preparing for the Olympic Trials. Pappas delivers an affected performance as Plumb Marigold, who’s ordered by her doctor to rest the day before the event. Never having taken a day off before, Plumb initially isn’t sure what to do with herself, but she ends up spending most of the afternoon hanging out with the guy (Chase Offerle) who works at the local bakery. The bits involving athletic preparations prove to be far more involving than the standard material focusing on family dysfunction and romantic woes. WINDOW HORSES – It required an Indiegogo campaign to raise the funds to create this animated endeavor, but those who generously provided donations were doubtless pleased with the finished product. Subtitled The Poetic Persian Epiphany of Rosie Ming, this adaptation of Ann Marie Fleming’s graphic novel (with the author herself handling directing and scripting duties) tells the story of Rosie (voiced by Sandra Oh), a young Canadian girl of Chinese and Persian descent. Living with her doting Chinese grandparents since her mom and dad are no longer on the scene, Rosie has unexpectedly been invited to participate in a poetry festival in Iran. Her journey not only provides her with valuable experiences but also answers some burning questions involving her parents. The animation style is bright and trippy, and assorted asides involving poetry, politics and culture are nicely integrated into the central narrative of an inquisitive girl who grows as an artist and as a citizen of the world thanks to the individuals surrounding and supporting her. 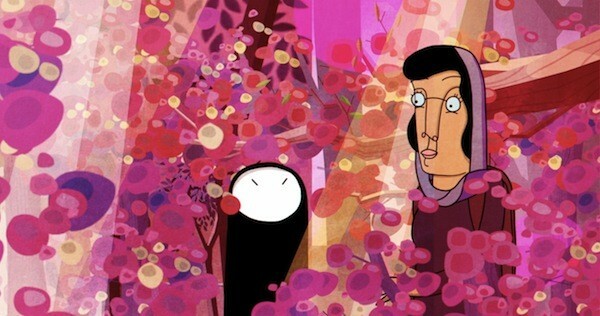 In the Narrative Features category, Window Horses won the Human Rights Award from the RiverRun jurists.